Bus driver kills twins, injures brother in Ogun - BlogIT with OLIVIA!!! A commercial mini-bus, a Toyota Picnic with number plate KTU 175 DZ, crushed two children of the same parents to death on Friday in Ita Oshin area, Abeokuta, Ogun State while they were on their way to school. The accident, according to an eyewitness, occurred at about 8am. The deceased were female twins, named Adijat and Mutmainat Edunjobi, and they were eight years old. It was gathered that the bus driver, Adewale Ojo, who was speeding, lost control, ran over the pupils, killing them instantly and injuring their 14-year-old brother. The bus was said to be coming from Sango-Ota, Ogun State to Abeokuta when the incident occurred. An eyewitness, a mechanic, said he and other sympathisers took the corpses of the deceased and their injured brother to the Neuro-Pyschiatric Hospital, Aro, Abeokuta, located about 500 metres away from the scene of the accident. He said, “We heard a sound and we quickly rushed down before we realised that a vehicle had knocked down some pupils in school uniform. 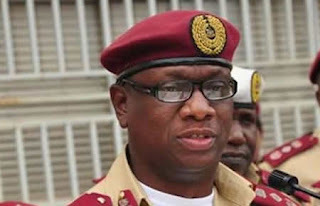 The Ogun State Sector Commander, Federal Road Safety Corps, Adegoke Adetunji, who confirmed the accident, said it was a lone accident in which the driver ran over the children. Adetunji blamed the driver for dangerous driving, saying that he lost control and ran over the children. He said, “We got the report of the accident, which happened around 8am, at Ita Oshin area of Abeokuta. “it was gathered that the Toyota Picnic bus with registration number KTU 175 DZ was coming from Sango-Ota.” He said that the driver of the vehicle, who tried to escape, had been arrested by the police and taken to Lafenwa police station in Abeokuta. The sector commander advised motorists against dangerous driving, saying they should put into consideration other road usees.